The Tsunami Rangers are well know for their crazy antics in big surf, wild rock gardens and surfing in caves. 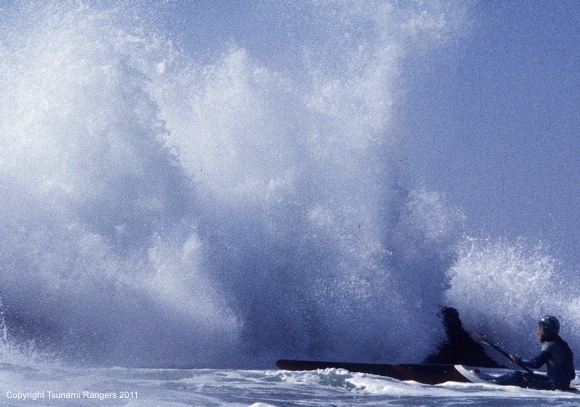 This band of renegade paddlers spent many a year playing along the west coast of the US and become renown for smashing boats and big wave surfing. I have an inclination towards coastal exploration (a diplomatic way of saying rubbing my kayak up against rocks and cliffs in frothy water), but there are few mentors in my neck of the woods with any real experience in this type of playful (and sometimes painful!) 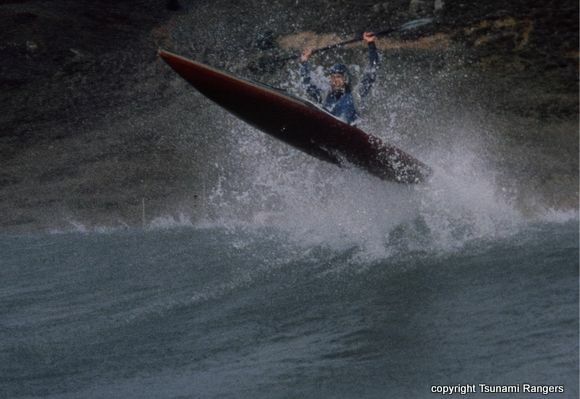 style of paddling. Recently Team Fat Paddler had the pleasure of hosting the Tsunami Rangers’ very own Captain Kuk, who on a sunny Sydney morning shared his experience and skills with us as we worked the waves (and for Gelo, the cliffs!) of our local rock gardens. The experience left us enthralled with the possibilities, but his departure left us with both a taste of the possibilities and a distinct lack of mentors here who could help us continue to develop. The other Team Fat Paddler rock-lovers are, like myself, complete beginners in this area. Between us we have many questions on both rock gardening and surfing so I decided to approach another Tsunami Ranger, Commander Eric Soares, and asked if he’d be willing to share his knowledge with some antipodean rock-gardening wannabes. I’m humbled to say he was generous in his answers and willingness to share – I hope you enjoy our interview. FP: Eric, thanks kindly for taking the time to help some beginners on the other side of the Pacific. Our questions are really on two areas of interest for us, namely kayak surfing and playing amongst the rocks. Firstly, some people who have watched video footage of the Tsunami Rangers think we are mad for wanting to do this at all. Are we a few cans short of a six-pack to want to do this in the first place? Eric: Why yes, you are. But since you’ve taken the plunge, I say go for it. If you don’t have a mentor around, you can teach yourselves. Just slow down, check everything out each time, and then go for it boldly. Later that evening, as you catch up on the six-pack, debrief and share what you learned. Vow to improve. FP: Ok, so lets put our sanity aside for a second and discuss surfing first up. You wrote a great post recently on entering the surf and playing around in the soup. For us beginners who, errr, aren’t exactly good rollers, this seems a little scary. Is it an absolute necessity to be able to roll before attempting to play in waves? Eric: Yes. If you can’t roll, you can’t brace properly and will thus be afraid to fully commit. If you don’t commit, you’ll never be able to surf anything except a little mushball of a wave. Try really hard to learn to roll. In the long swim (ahem), it will be worth it. FP: Clearly, being able to swim is a pre-requisite. But what about safety equipment, what type of gear should we invest in to ensure we can play another day? Eric: Good helmets, of course, to protect your “short of a six-pack” brain. Well-fitting PFDs, to protect your thorax a bit. And good shoes (we use neoprene booties, but those might be too hot in Oz) so you can walk on coral, rocks and urchins. Oh yes, and skin covering. In California and Oregon, that’s a full wetsuit; in Oz, that’s Lycra. FP: Many paddlers down here started as surfers and have a good general sense of surf awareness, understanding of rips and currents etc. Are there other facets of the surf zone that kayakers need to pay particular attention to? Eric: Nope. Except breaking waves of course. And rocks. Rebar is also bad. Sewage outlets…. FP: For surfing specifically, what should we look for in a kayak? What design aspects make a good surf kayak? Eric: Any boat will do. I wouldn’t use your brand new graphite baidarka (too precious) or a fat tub boat (not responsive and hard to roll). 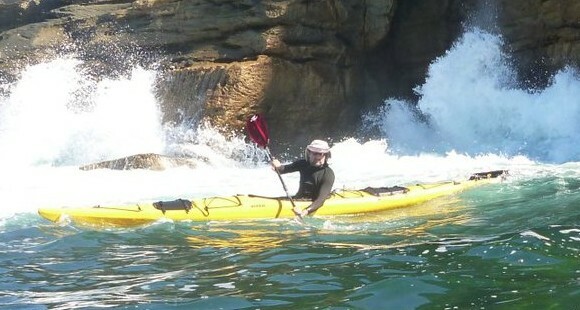 River kayaks are good, and sea kayak with rocker works well. Then there are specialized surf kayaks, surf shoes, wave skis, short SOTs, and the like–all very good. Boats made of Kevlar or rotomolded plastic will break less often. But all boats can break in surf and rocks…. FP: What about boats for rock gardening – what design aspects help when playing in the froth and tight spaces of a rock garden? And what modern boats are available now that are suitable (since not many of us can get our hands on a Tsunami X15!)? Eric: Reread my last answer. If you can’t get a Tsunami X15, then I’d say get a boat with rocker. A river kayak is good. Even a cheapo sit-on-top is fine, as long as it is maneuverable. FP: Ok, let’s move onto rock gardening. For beginners who want to play amongst the rocks, what particular skills should we focus on acquiring first up? 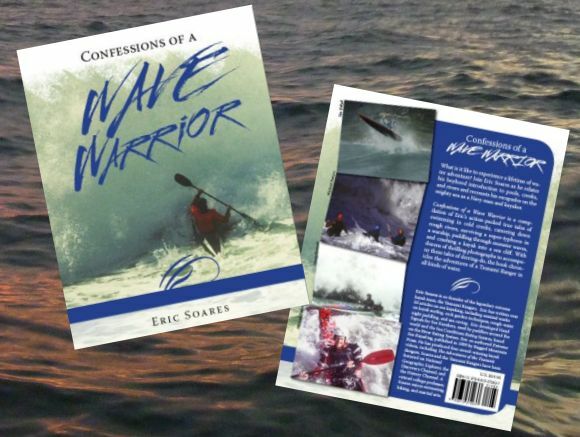 Eric: Rough-water swimming, rescues of all types, rolling, and surfing. FP: Inevitably, we’re going to fall out of our boats in the rock zone. What is the best approach to get out safely when ripped out of your boat in amongst the rocks? Eric: Get out quickly! If you have a SOT (sit-on-top) such as the X-15, just jump back aboard and paddle back out fast. If you have a sit-inside kayak, decide quickly to either re-enter & roll and then get outside or swim your boat out. If you really mess up, go into shore or climb high onto a rock and consider your options. The most important thing is never let your body take a beating on the rocks. This is a complex subject. I deal with this issue in one of my blog posts (http://tsunamirangers.com/2011/04/11/between-a-rock-and-a-hard-wave/). Check this out and read all the comments. FP: There’s some strong opinions on the type of paddles best suited to this type of paddling, with many frowning on my use of a Greenland paddle in the froth. What do you prefer to use and am I an idiot for sticking with my GP? Eric: Your GP is fine. I’d recommend a GP (or any paddle) with reinforced tips, so it has less chance to break. Graphite is no good. 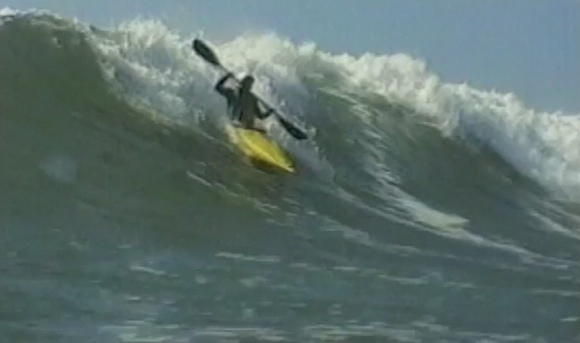 I use a Merv Larson surf paddle made of compressed Kevlar. I’m learning to use a GP and have even used a canoe paddle. My current GP is too delicate (light cedar), so I’m hankerin’ for one with reinforced tips. Bottom line: other than graphite, any paddle which the boater can use easily and roll with is fine. FP: Eric, it’s been a real pleasure to get your insights on this. Do you have any final advice for those of us who want to give this type of dynamic paddling a go? Eric: Yes. Read books and watch videos on kayak surfing to keep you motivated and to fill in knowledge holes. If you can find mentors to help you, provide them with lots of beer from your dwindling six-pack, and feed them sausages from the barbie. Seafood is good. If you can’t get a mentor, take a clinic or two from someone reputable (recommended by people you trust). Of course, experience is your best teacher, so boogie out to the surf and Ride the Grooveline! FP: Commander Eric Soares, Tsunami Rangers. Thank you kindly for your time. Note: Eric and fellow Tsunami Ranger John Lull have just posted an excellent article on exiting the surf, an area I hadn’t even thought to touch on! Read their excellent article here. Build on the “team” spirit and watch each other in the surf and rocks. Support each other with encouraging and helpful advice. Go out regularly and try different locations and conditions. Work on the fine details especially when you re-visit a familiar spot. Paddle at night to increase awareness, especially of sounds and water movement. When learning on your own, take your time. As always, excellent advice. Thanks Kuk! FP, this is one of the best “interviews” I have read in a long time :-). While witty it still informs the reader on the in-and-outs of rock gardening. Great light hearted article. Very nice layout with the pics and interview. If you have more questions in the future, feel free to ask. RIP Eric and thanks for the inspiration.